Information for the Gulf of California Islands Flora and Fauna Protected Area Marine Zone of Espiritu Santo Archipelago National Park. The Gulf of California Islands Flora and Fauna Protected Area was established on August 2, 1978 and includes close to 900 islands and islets which represent approximately 50% of all the islands in the country of Mexico. The Espiritu Santo Archipelago which is part of the Gulf of California Islands Flora and Fauna Protected Area as well as adjacent water are some of the most biodiversity and productive in the Sea of Cortez. The Marine Zone of Espiritu Santos Archipelago National Park was established on May 10, 2007. It has an area of 48,000 hectares. It is made up of three core zones, Espiritu Santos, La Partida and El Bajo. 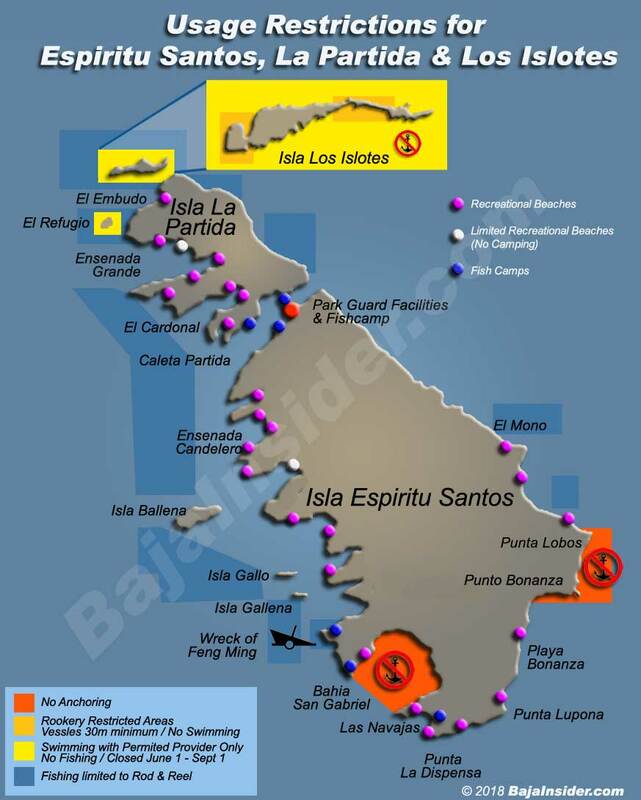 There are three areas where fishing is prohibited; Los Islotes, Bahia San Gabriel and the rocky reef from La Bonanza to Punto Lobos. We kindly ask that in order to enjoy these Natural Protected Areas during your visit please observe the following rules. • The use of wave runners, jet skis, water skiing, surf tables, windsurfers, banana, scooters or similar devices in size and use are forbidden within National Park limits. • Do not land on any islet, respect the minimum distances for approaching bird reproduction areas (50m, 165ft) and sea lions (30m, 100ft) and anchor your boat in sandy areas, not in the rocks or coral. • Mooring buoys are for the use of permitted providers is for boats of 30' or less. No anchoring near Los Islotes is permitted. • Avoid outdoor defecation. All boats in the Park must have a contained toilet or latrine on board, if not try to bring portable toilets or latrines. Never bury toilet paper or discard it on the islands. • To avoid the destruction of our natural and cultural heritage, please do not take souvenirs such as stones, plants, shells, corals or archeological pieces. • Help us to preserve and protect the dunes. Avoid walking or putting structures on them, as well as extracting sand, destroying plants or collecting fauna that inhabits them. • Bonfires are allowed only with materials that come from outside the Archipelago. Do not use wood or branches from the island to make fire, use camping stoves to cook. • Never leave garbage on the islands. In case you find garbage pick it up and dispose of it properly at home. • Swimming or scuba diving in the rookery areas of Los Islotes is forbidden. • For sport fishing it is necessary to have a fishing license issued but the National Commission of Fishing and Aquaculture. One license for each person on board, whether they are actively fishing or not. • In the subzones of sustainable use of natural resources fishing is permitted with rod or harpoon. • In the subzones of traditional fishing, sport fishing is allowed only with rod and reel.